It’s been quite the ride in the sport of boxing over all these years. From a kid growing up in the Midwest who fell in love with the game in 90′s, I have had a great chance to discover the sport the past ten years hands on, first reporting down in South Florida and most recently out here in Las Vegas. As the times have changed, so too has the media coverage, as I saw my passion for writing turn into a new focus towards videos a few years back. It’s been amazing to see my YouTube Channel get so much love the past few years and behind the scenes I’ve been working on a completely different kind of project. I will be fighting my first official amateur bout on June 9 at Zappo’s here in Las Vegas. 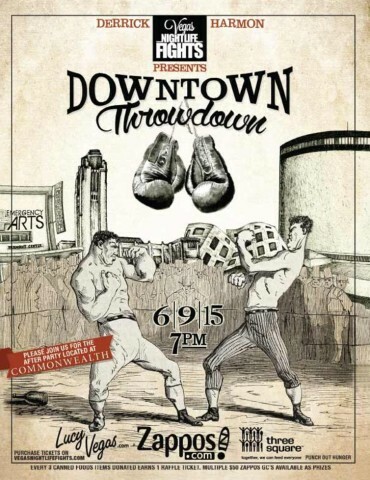 Former world title challenger Derrick Harmon is presenting his latest edition of “Vegas Nightlife Fights” and I knew it would be great fit to jump from the media field and into the ring. I don’t have any official amateur bouts on my record, but people will be surprised how comfortable I am in the ring, after all these years around the game. I’ve also got some great help in the city from some top prospects and trainers in recent months who have helped me along the way. My opponent is Miguel Barragan. Should be a good showdown. Set for 165 pounds. Anyone needing tickets to the event can get at me via CRobinson@hustleboss.com or via Instagram or even Facebook if you know me in the boxing community. Ultimately the purpose of this venture is to continue to transition over to the fighting side of the boxing game and show a different side of the sport. The deeper you get into the game the more of the sport you will be able to show and there will be several videos stemming from this project that will have a completely different feel to them. I will of course continue to update all of my media outlets and do in-depth reporting on other fighters in the sport, this is just a personal series that will tie a lot of things together. I am working with an active group of sponsors for this series and anyone looking to get in on the action can reach me directly, as I can explain in detail how your brand will receive great exposure throughout this series as well as on my various media platforms. Stay tuned for more information in the coming days on what to expect from this upcoming fight and series and please follow our friends at Lucy Vegas for more updates as well. See you all June 9.